It may seem like it was eons ago, but in reality it has been exactly one month. On the night of June 17, a young man named Dylann Roof strolled into the Emanuel African Methodist Episcopal Church for evening bible services. He was joined by ten black parishioners, including the senior pastor and South Carolina State Senator Clementa Pinckney, as they enjoyed their evening of fellowship and worship with each other. As the bible study came to a close, Roof allegedly pulled a Glock 41 .45 caliber handgun and opened fire. After five reloads, nine of the parishioners laid dead; the tenth was spared by Roof allegedly so that person could tell the story of Roof’s attack. Law enforcement quickly caught Roof in North Carolina the next morning and extradited him back to the quaint Southern city by the Atlantic Ocean, resplendent with its Spanish moss hanging from the trees, palmetto trees swaying in the wind off the beaches and seeped in the history of not only the United States but of the Confederate States of America (Fort Sumter was the site of the first shots of the Civil War in 1861). Further investigation, however, revealed an ugly truth that many have turned their heads to over the years. Roof, through leaving his one victim alive in the church (it is reported he told her he wanted to start a “race war”) and through a manifesto on a website allegedly his that featured photographs of him posing with the Confederate Battle Flag as well as standing on the U. S. flag while spitting on it, brought to light the horrific factor that a relic of the South had now been corrupted into something viewed with hatred by many U. S. citizens. Before we go on, we must establish the history. The Battle Flag was in no stretch the official flag of the CSA. There were three different flags that were tried by the government, but all bore too much of a resemblance to the U. S. flag for soldiers from either side to be able to differentiate between the two in the heat of battle. Thus, the Battle Flag – most notably carried by General Robert E. Lee’s Army of Northern Virginia but also carried by other Confederate factions – was used so troops could see where their side of the battle was located. Following the end of the Civil War, the Battle Flag’s usage drifted off, supposedly into history. That would take a turn, however, when Southern Democrats, stifling under the boot heels of the Reconstruction period and the stiff penalties that were imposed by the victorious North and the Republican Party, formed the racially motivated Ku Klux Klan and resurrected the banner, in essence, as their battle flag. While also carrying U. S. flags in several marches through the early part of the 20th century (including a particularly noteworthy march through Washington, D.C.), the Battle Flag was more commonly used in the South along with the Battle Flag. In 1894 the Battle Flag was incorporated into the state flag of Mississippi, where it flew until 1906 when a legal error failed to give the state either an official flag or a coat of arms. That banner was the de facto flag of the state until 2001, when it was officially put back into use for a short period before being replaced. It was also used in the flag of Georgia beginning in 1956 when the Georgia General Assembly used a design from a man named John Sammons Bell, who supported segregation across not only the Palmetto State but also the former Confederacy. That flag flew until 2001, when it was removed. In 1961 the South Carolina General Assembly added the Battle Flag to the flagpole under the U. S. and South Carolina flags to “commemorate” the 100th anniversary of the Civil War, but it was also put there as a protest at the ever growing movement for civil rights among minorities, especially blacks, across the South and the remainder of the country. Those flags would all fly together until 2000, when the Confederate Battle Flag was moved from atop the South Carolina State House to a Confederate memorial on the State House grounds. Which brings us to last month and its aftermath. Instead of perhaps examining the issues that were at the forefront of the horrendous act – mental health, drug abuse or misuse and gun availability – South Carolina Governor Nikki Haley decided to use the moment (especially after the photos surfaced of Roof and the Confederate Battle Flag and his manifesto of white supremacy) to call for the Battle Flag’s removal from the State House grounds. Really, what politician in his right mind had a chance in standing against that? Not to say there weren’t those that tried, but the vote to remove the Battle Flag (which needed two-thirds of the House and the Senate) rocketed through the political process. Six days ago, amid a somber ceremony that was deserving of a memento of history and a crowd that thought they were at a British soccer match, the Confederate Battle Flag came down and was moved to a museum. While many may cry that the Battle Flag is a part of their “heritage,” it isn’t exactly the heritage that you would like to remember. First off, the “heritage” is that of a treasonous act – secession from the United States – that, if performed nowadays, would have many screaming for the perpetrators to be shot on site. Secondly, the Battle Flag – despite its representation as the flag that thousands of Southern soldiers fought for – had been utterly corrupted by first the Southern Democrats, then the KKK and today by white supremacists. Germany has a heritage, too…but they choose not to fly the Nazi Party flag, which was once the official German flag, because of the baggage it has entailed in its existence. The removal of the flag from the South Carolina State House – and other official government buildings across the South – was long overdue and right in its execution. Here’s where it might get interesting for some of you. Since the removal of the Battle Flag in South Carolina, there have been other actions that are dubious at best. The television show The Dukes of Hazzard was removed from syndicated broadcasting because the Dodge Charger featured on the show and driven by the Duke boys, the General Lee, featured a Confederate Battle Flag ironically atop the roof. Video games were removed from the Apple Store because the games featured the flag during gameplay. This would prove to only be the tip of the iceberg, however. 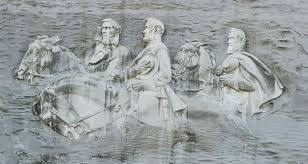 There are movements across several Southern states to remove Confederate monuments from their locations, none probably more ludicrous than the idea to remove the carvings of General “Stonewall” Jackson, Confederate president Jefferson Davis and Lee from a mountainside in Stone Mountain, GA. Add into the fray movements to rename schools, other buildings and even streets that have ties with a Confederate history and it does reach the point of going too far. The Civil War was the darkest period in U. S. history and there are some pretty bleak things that have been done in the name of this country. While the Battle Flag might have been unfairly blemished since that time, its removal was appropriate considering what it inspired in the South Carolina massacre. Taking that tragedy and using it any further, however, is wrong because it is an attempt to whitewash the historical significance of an event. Rather than trying to act as if those four bleak years from 1861-1865 didn’t exist, why not demonstrate how far we as U. S. citizens have come? Even a school field trip from Robert E. Lee Middle School (literally tens across the U. S.) can learn about the man, the fact that he was a highly decorated graduate of West Point that battled for the Union in the Mexican-American War of 1846 and in Texas protecting U. S. citizens from Indian attacks in the early 1850s before defending his home of Virginia while seeing Confederate monuments and battlefields. Just because one part of history has been tarnished is no reason to remove all of it from existence. It also isn’t a reason to remove it from entertainment or educational purposes. While the Confederate Battle Flag has reached the place it should have been many years ago – in a museum case – that’s not a reason to completely strip it from U. S. history. This entry was posted in History, Politics and tagged Confederate Battle Flag, Georgia, Nikki Haley, South Carolina, Television, Video Games.